In all spheres of society we have rules, we have rules that are part of law and order, rules of the road, even some restaurants have rules (the smart ones that I cannot afford to go to) represented as a dress code. Even when you graduate you are expected to wear smart clothes and a gown and that is a dress code and hence a rule. Language has it own set of rules referred to as grammar and when you learn to computer code like when making an HTML page you soon learn that if you do not follow these rules your page will not work since you broke the code rules! This is why I have made instructions on submitting to our Weblog assignments via email http://bcb703.blogspot.com/2006/03/hints-on-using-this-weblog_30.html . If they are not followed the current Weblog will break in someway. Incidentally if the site does look broken, just do a quick check on your text size of your browser - it should be set to text size medium and a larger size will not work [Hint: on the Toolbar open View and from the drop-down select Text Size and then select Medium]. Since this is some 650 pages, from the students point of view, its is, well a little overwhelming! Basically it is so detailed, and it really is focused on research publication, and therefore would be rather difficult to use for your course report. It is best used as a reference and we will get a departmental copy for that purpose, possibly CSIR will purchase one for their library. Now we come to a really nifty way to have some help with CSE writing right on your desktop, it is with the help of Dr. Able Scribe Student's Guide to Biostyle and is a quick reference for drafting papers in the biological sciences. The Guide covers reference formats, text citations, page layouts, and basic writing conventions. It is Freeware, so can be freely distributed for non-profit purposes and was revised in January 2003. Since every Journal while adhering in principle to the CBE/CSE will have their own particular (trademark) style it makes writing for a scientific publication a little chaotic. Consequently this particular resource uses the Journal BioScience as a standard for drafting papers in the biological sciences. Student's Guide to Biostyle is actually a Windows Help file and when installed is accessible like any other Window program that you have installed on your computer. So you go Start, Programs, DOC Style, CBE Style Guide to launch it. To install it you can download it from www.docstyles.com , unzip it and run the setup file. So this Writing Document Resource is always available for you to refer to, so please take the time to install and use it - it will help you in the long term to get better marks. Well all the best on a lovely Easter Sunday. But the best is Wikipedia is an encyclopedia with content created by its users. All original material contributed to Wikipedia is deemed to be free content under the GNU Free Documentation License, meaning that it may be freely used, freely edited, freely copied and freely redistributed. Because pages are continually being edited, no article is ever finished. Here are the links to the last posting I made "DID WE REALLY LAND MEN ON THE MOON?" I have not checked these so they may not all work. Just dip into these to help with you assignment. You are not expected to go through all of these rather look and open up a site to see what they have to say. Please these are also not meant to be studied! At most a couple are to be read as reference material and for general interest. Most of these are refutting the Hoax allegations ... OK but it is your views that count most in this case. Here is a web page on TMLWF at Phil Plait's Bad Astronomy site. Here is a web page on the FOX special at Phil Plait's Bad Astronomy site. An official NASA website debunking the hoax. Moonbase Clavius - an excellent debunking site. Did we land on the moon?. Keith Mayes site on Bart Sibrel. conditions seen in the lunar photos. Here's yet another webpage by Neil Atkinson dealing with TMLWF. Here's another webpage dealing with "The Moon Landings were Faked" (TMLWF). A rebuttal of a report on the "Moon Landing Hoax" in the "Weekly World News"
This page is a parody of a TMLWF page - or is it? An article by the UPI about Bart Sibrel's character after his attack on Buzz. Here is a Spanish language hoax debunking page inspired originally by page written by Alberto Matallanos. The date July 20, 1969, the event the first lunar walk by man. I remember as a very young kid in the UK seeing NASA footage on TV while at school and not being 100% convinced then! I remember, how everyone barring me seemed so excited - the Kellogg Cornflake box even had free colour transparency slides marking the event and I simply gave mine away uninterested in the event. Somehow, it did not seem as spectacular as seeing Concorde lift off and fly over our skies a couple a years back. In the 1960's Concorde shape, size and speed was simply amazing, its silhouette against a grey English sky was awe-inspiring (I was a tropical African kid recently "moved" to England where everything seemed insufferable dull, grey and depressing). Back to the NASA photos and videos, I aired my opinions at school and was summarily canned for impudence by our Headmaster. I still remember clearly wondering how they got the exposure right, was the light on the moon so omnipresent that you could get foreground exposure detail even when taking directly into the sun? I had acquired a camera and had been exploring taking evening photos of long shadows created at such high latitudes and struggled to get my exposures right. Since there was no atmosphere, there was no protection from fierce cosmic rays, did this not pose problems for taking photographs on the moon? - It looked a rather ordinary large-format camera without any casing such as they used for underwater photography? Over the years I have heard the rumours of conspiracy theory, and the claims that the USA never landed men on the moon but did not pay much attention, having no real interest in conspiracy theory - my philosophy is to get on with life and do your best, and even if they were true what could you do? I am telling this because, when attempting to find an interesting exercise to explore in the Science Methodology course to encourage debate on the courseware Weblog I found a Google Video the Fox television programme called "Conspiracy Theory: Did We Land on the Moon?" This programme presents the exact opposite and re-interprets the 20th century's high point of science and technology as a very expensive science fiction film, and describes the propaganda designed to win a psychological edge over the then Soviet Union during the Cold War. The Fox film certainly highlighted issues that had troubled me as a kid, but pushed its conspiracy theory much further. As a kid I doubted the validity of those photographs rather than whether we landed on the moon which I accepted (as a kid could I think a government would lie to the rest of the world?). http://science.nasa.gov/headlines/y2001/ast23feb_2.htm [Accessed 17 April 2006]. 1. Crosshairs that were etched onto the lenses of the cameras appear, on some photos, to be behind objects, rather than in front of them where they should be, as if the photos were altered. In photography, the light white color (the object behind the crosshair) makes the black object (the crosshair) invisible due to saturation effects in the film emulsion. The film particles that ought to have been black were exposed by light from the adjacent brightly lit particles. 2. The quality of the photographs is implausibly high. NASA selected only the best photographs for release to the public, and some of the photos were cropped to improve their composition. There are many badly exposed, badly focused and poorly composed images amongst the thousands of photos that were taken by the Apollo Astronauts. Many can be seen at the Apollo Lunar Surface Journal. Photos were taken on high-quality Hasselblad cameras with Zeiss lenses, using 70 mm medium format film. 3. There are no stars in any of the photos, and astronauts never report seeing any stars from the capsule windows. Yuri Gagarin commented that the stars were astonishingly brilliant, and some NASA photos do show stars. Hoax proponents claim that the stars in the photos were removed, because professional astronomers would be able to use them to prove that the photos were not taken from the moon. (See, for instance, the photos above.) Stars visible from the Space Shuttle Atlantis. No stars visible observing The Moon and Mir from the Space Shuttle Discovery Space Shuttle Atlantis docked with Mir, no stars visible from the Soyuz spacecraft. Zarya from the Space Shuttle, no stars visible. There are also seldom stars seen in Space Shuttle, Mir, International Space Station or Earth observation photos. The sun in the Earth/Moon area shines as brightly as on a clear noon day on earth, so cameras used for imaging these things are set for daylight exposure, with quick shutter speeds in order to prevent overexposing the film. The dim light of the stars simply does not have a chance to expose the film. (This effect can be demonstrated on earth by taking a picture of the night sky with exposure settings for a bright sunny day. Science fiction movies and television shows do confuse this issue by depicting stars as visible in space under all lighting conditions.) Stars were easily seen by every Apollo mission crew except for the unfortunate Apollo 13 (they couldn't see the stars due to the fact that oxygen and water vapor created a haze around the spacecraft). Stars were used for navigation purposes and were occasionally also seen through cabin windows when the conditions allowed. To see stars, nothing lit by sunlight could be in the viewers field of view. Stars are not dramatically brighter in space (above the Earth's atmosphere). Professional astronomer and two-time space shuttle astronaut Ronald A. Parise stated that he could barely see stars at all from space. He had to turn out all of the lights in the shuttle to even glimpse the stars. Believers in the hoax theory contend that the stars were removed from the photographs because they would have looked identical to the stars as seen from the Earth, i.e. no parallax view. However, the distance from the Earth to the Moon is very small compared to the distance to the stars, so no parallax would have been visible anyway. (The nearest star is over 100,000,000 times farther away than the Moon, and most stars are much farther away than that.) 4. The color and angle of shadows and light. Shadows on the Moon are complicated because there are several light sources; the Sun, Earth and the Moon itself. Light from these sources is scattered by lunar dust in many different directions, including into shadows. Additionally, the Moon's surface is not flat and shadows falling into craters and hills appear longer, shorter and distorted from the simple expectations of the hoax believers. More significantly, perspective effects come into play, particularly on rough or angled ground. This leads to non-parallel shadows even on objects which are extremely close to each other, and can be observed easily on Earth wherever fences or trees are found. 5. Identical backgrounds in photos that are listed as taken miles apart. Detailed comparison of the backgrounds claimed to be identical in fact show significant changes in the relative positions of the hills that are consistent with the claimed locations that the images were taken from. Parallax effects clearly demonstrate that the images were taken from widely different locations around the landing sites. Claims that the appearance of the background is identical while the foreground changes (for example, from a boulder strewn crater to the Lunar Module) are trivially explained when the images were taken from nearby locations, akin to seeing distant mountains appearing the same on Earth from locations that are hundreds of feet apart showing different foreground items. Furthermore, as there is no atmosphere on the Moon, very distant objects will appear clearer and closer to the human eye. What appears as nearby hills in some photographs, are actually mountains several kilometers high and some 10-20 kilometers away. Changes in such very distant backgrounds are quite subtle, and can be mistaken for no change at all. As the Moon is also much smaller than the Earth, the horizon is significantly nearer in photographs than Earthbound observers are used to seeing (an eye 1.7 m above completely flat ground will see the horizon 4.7 km away on Earth, but only 2.4 km away on the Moon). This can lead to confusing interpretations of the images. 6. The number of photographs taken is implausibly high. When the total number of official photographs taken during EVA of all Apollo missions is divided by the total amount of time of all EVAs, one arrives at 1.19 photos per minute. That is one photo per 50 seconds. Discounting time spent on other activities results in one photo per 15 seconds for Apollo 11. This is even more remarkable considering that many locations in the photographs are situated miles apart and would have taken considerable travel time, especially in bulky pressure suits. On top of this, the cameras were neither equipped with a viewfinder nor with automatic exposure, which means that taking good pictures would take considerably longer. The astronauts were well trained before the mission in the use of photographic equipment. Since there were no weather effects to contend with and the bright sunlight scenes permitted the use of small apertures with consequent large depth of field, the equipment was generally kept at a single setting for the duration of the mission. All that was required of the astronauts was to open the shutter and wind the film to take a picture. In these conditions it is possible to take two photographs a second. The camera was in a bracket mounted on the front of their spacesuit, so they looked straight ahead at what they wanted to photograph; no viewfinder was needed. Also, many of the photographs were stereoscopic pairs or sets of panoramic images, taken immediately after each other. The Apollo Image Atlas shows that 70mm magazine S of Apollo 11 has 122 photos taken during the walk on the surface - less than one per minute. In addition, by looking at the photographs in sequence, one can see that very often several of them were taken in rapid succession. Most of the above was quoted from: Wikipedia contributors. 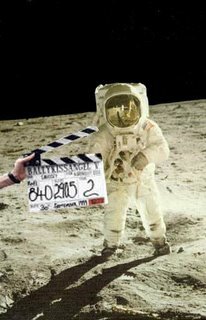 Apollo moon landing hoax accusations [Internet]. Wikipedia, The Free Encyclopedia; 2006 Apr 15, 15:20 UTC [cited 2006 Apr 15]. Available from: http://en.wikipedia.org/w/index.php?title=Apollo_moon_landing_hoax_accusations&oldid=48573917 . Your assignment should start of with a explanation of why the Apollo space programme was launched (The political/military agendas). Then you should follow this stage-setting with what you consider to be probability (with justification and supporting information) that NASA landed spacecraft on the Moon and collected lunar rocks NASA landed manned craft on the Moon during the Apollo missions That the NASA photographic evidence is genuine and not tampered with to support USA landing of man on the moon. Finally review what was the impact of the NASA and the USA convincing the World that it had landed men on the Moon during the Apollo space programmes and was Kennedy's Special Message to Congress fulfilled? given attention over many weeks and months, because it is a heavy burden, and there is no sense in agreeing or desiring that the United States take an affirmative position in outer space, unless we are prepared to do the work and bear the burdens to make it successful. diversion from other important activities where they are already thinly spread. It means a degree of dedication, organization and discipline which have not always characterized our research and development efforts. It means we cannot afford undue work stoppages, inflated costs of material or talent, wasteful interagency rivalries, or a high turnover of key personnel. New objectives and new money cannot solve these problems. They could in fact, aggravate them further--unless every scientist, every engineer, every serviceman, every technician, contractor, and civil servant gives his personal pledge that this nation will move forward, with the full speed of freedom, in the exciting adventure of space. For me I am about 95% certain that we landed spacecraft on the moon and collected lunar material, about 67% certain that we had manned landings on the moon and 5% certain to the authenticity of the photographs (probably due to technical reasons, I suspect they were photographed on earth) - this is entirely my personal views and in this case I leave the verdict for to you to discuss, decide and defend. Please post your assessment (as a new article) on the both your own personal Weblog and this Courseware Weblog by Friday 21 April.